…and we are in full swing. Kira is quite fascinated by the paper snowflakes, by the lights outside the house, by Christmas songs and big blow up lawn decorations (we have a puppy and a santa). Pretty much everything!!! 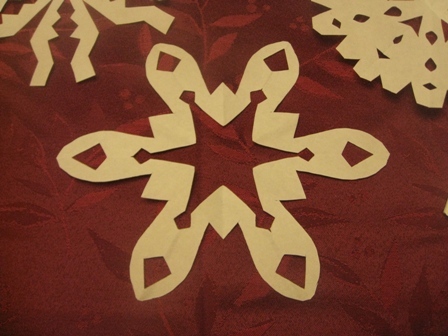 Note to self: Don’t try to cut snowflakes with 19 month present. Wait until bedtime. Last year this time we were struggling with getting Kira to sleep at night without being held. We were still living in the apartment. Chris and I barely recognized each other and Christmas was the last thing on my mind. 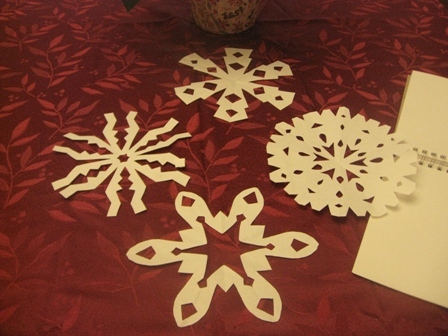 If you’re interested you can find the directions for these beautiful snowflakes here. Hope the holiday season is off to a great start for you too. Happy holidays to you! Holidays are so much fun with a young child. Kira may not remember this one, but you will. Take lots of pix! Pretty snowflakes! I finally had a chance to sit and check out your blog. I’m glad I haven’t missed much. Guess we’re both extra busy with the holidays right around the corner. Can’t wait to be in your comfy-cozy home again and to share the experience with my family. Jojo is freshly groomed for the occasion! See you in a few days! !